Who, in their right mind, would want to spend significant time in a place that has an average temperature of -54°F and where there is no sunlight for half the year? No one … in their right mind. That’s the basic premise behind Ashley Shelby’s comic novel (comic in the way Catch-22 or M*A*S*H is comic) South Pole Station. Cooper Gosling is an artist and she’s had a few set-backs recently. Enough to have her question what she’s doing and where she’s going in life. And with that, she applies for the National Science Foundation’s Artists & Writers Program, and after completing a lengthy form, she is accepted to be one of a few people to live and work at the South Pole for the next year. What Cooper discovers is that everyone working there has their own, not too dissimilar reasons for getting away from most of humanity and hiding out at the Pole. Whether it’s as cook, scientist, or event he station manager, everyone seems to harbor a secret reason for being there. Cooper goes through the motions, learning the unusual ropes for living as a ‘Polie’ – such as learning to pee in a bucket and emptying the bucket later (but being careful not to spill the contents of the bucket on fellow Polies), and the annual ‘pairing-up’ mixer when everyone chooses the Pole Mate … followed by the women’s meeting to discuss the pairings and to make sure that no one is moving in on someone else’s Pole Mate (and to rate the men and their availability). But when a ‘scientist’ who is an affirmed climate-change denier comes to the Pole, he receives a cold welcome from everyone except Cooper. Author Shelby has put together a comic novel full of interesting, quirky characters. In the tradition of the best of the comic novels, it is the characters who drive the story and the location becomes as much a character as the individuals. And of course each is as scarred and outcast as Cooper (including the climate change denier). But Shelby walks a fine line here, giving us oddball characters who don’t fit in ‘normal’ society, but at the same time we find something likable and something relate-able about these people, and it is this that pulls us in to the story in the early pages and has us eagerly reading through the chapters. As the book nears the end, the circumstances and politics that descend on South Pole Station come to a head and the comic aspects of who, what, where, and why all come together, making this truly a delightful read. Looking for a good book? 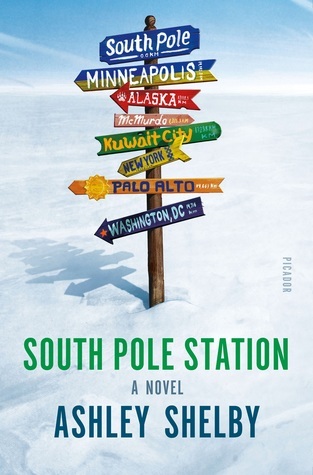 South Pole Station, by Ashley Shelby, is a truly enjoyable read and should forever be among comic novels such as A Confederacy of Dunces, Catch-22, and Breakfast of Champions. PS Ashley Shelby – as a Minnesota taxpayer … you’re welcome.